Here is a list of nonalcoholic substitutes for recipes that call for various wines, spirits and liqueurs. Do remember substitutes won’t necessarily mimic the flavor of the original ingredient. The intention is to add some acidity and contrast as well as intensify flavors. Substituting ingredients takes a lot of trial and error practice. If this is for your day-to-day cooking have fun experimenting. If you are cooking for guests and special occasions then you may be better served by making an extra trip to the store to get the proper ingredient. If using alcohol in cooking is simply not an option then experiment with these nonalcoholic suggestions. Amaretto Non-alcoholic almond extract; orgeat Italian soda syrup; or marzipan. For: 2 tablespoons amaretto or other almond-flavored liqueur, substitute: 1/4 to 1/2 teaspoon almond extract For an alternative with alcohol and a different flavor variation try substituting equal amounts of hazelnut liqueur, chocolate liqueur OR coffee liqueur. Applejack or apple brandy Unsweetened apple juice concentrate; apple juice; apple cider; or apple butter. Per tablespoon of Apple Brandy (applejack) you can substitute 1 tablespoon Cognac OR pear Brandy OR any Brandy. Apricot brandy Syrup from canned apricots in heavy syrup; or apricot preserves. Per tablespoon of Apricot Brandy you can substitute 1 tablespoon Cognac OR pear Brandy OR any flavored Brandy of choice. Bourbon Non-alcoholic vanilla extract. 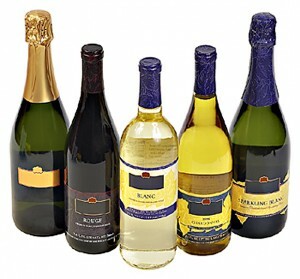 Champagne and other sparkling wines: Sparkling apple cider; sparkling cranberry juice; or sparkling grape juice. For 2 tablespoons bourbon, substitute the following: 1 to 2 teaspoons vanilla extract You can substitute equal amounts of brandy, rum or cognac. Cognac Juice from peaches, apricots or pears. Cointreau Orange juice, or frozen orange juice concentrate. Creme de Cacao Powdered white chocolate mixed with water; non-alcoholic vanilla extract and powdered sugar. Creme de Cassis Black currant Italian soda syrup; or black currant jam. Kirsch (Cherry) Syrup or juice from black cherries, raspberries, boysenberries, currants, grapes or cherry cider. Licorice or anise flavored liqueur Anise Italian soda syrup; or fennel. Mirin White grape juice mixed with lemon juice or zest. Muscat White grape juice mixed with water and powdered sugar 1/2 cup white grape juice with 1/2 cup of water and 1/8 to 1/4 cup powdered sugar. * adjust sugar to taste depending on your recipe. Pear Brandy Syrup from canned pears. OR use 1/4 to 1/2 teaspoon pear extract per tablespoon brandy. Any other flavored brandy such as Apple Brandy. Riesling White grape juice mixed with water and a pinch of powdered sugar. Sauternes Sauternes are sweet dessert wines. You can substitute equal parts of apple juice, depending on the recipe. Sherry Apple cider; non-alcoholic vanilla extract; coffee; or coffee syrup 2 tablespoons sherry, substitute the following: 1 to 2 teaspoons vanilla extract or 2 tablespoons orange or pineapple juice. To substitute sherry in a marinade: for 1/2 cup sherry use 1/4 cup vinegar + 1 tablespoon sugar + 1/4 water OR1 tablespoon vinegar, plus chicken stock or water to make 1/2 cup. Vermouth Apple cider; or apple juice mixed with lemon juice and water. Vodka Water; apple cider or white grape juice mixed with lime juice Substitute 2 tablespoons of aquavit, tequilla or white rum. Wine, White, Dry Water, chicken broth, bullion or consommé, ginger ale, white grape juice, diluted cider vinegar or white wine vinegar, liquid from canned mushrooms. Wine, Heavy For 1/4 cup or more port, sweet sherry, rum, brandy, liqueur, substitute the following: equal measure of unsweetened orange juice or apple juice plus 1 teaspoon of corresponding flavored extract or vanilla extract. If alcohol is not an issue then Vermouth makes a good substitute for white wine in a recipe as long as the recipe does not call for more than a 1/2 cup or so. How Much Alcohol Burns Out After Cooking? There is no exact way to know if all alcohol has been burnt off during cooking because there are simply too many variable such as cooking method (roasting, simmering, baking, etc.) and cooking temperature and duration. According to the USDA Data lab, 5% of alcohol still remains in a dish that has been simmered for over 2.5 hours. If you have family members or friends who wish to avoid alcohol then they should just assume the dish with alcohol is not appropriate for them to consume. If you are hosting guests that need to abstain from alcohol it is best to simply design your menu accordingly and avoid using alcohol at all. If this is not possible then you should inform the guest(s) so they can avoid any questionable foods. 1 cup of citrus juice, lemonade, pineapple or orange juice. 1/2 cup of fresh lemon juice or orange juice. 1 cup of tomato juice diluted by 1/4 with water or vinegar. 1/2 cup of light soy sauce and 1/2 cup of citrus juice. 1/2 cup of light soy sauce and 2 tablespoons of peanut oil. The Link above will take you to the Culinary Dictionary where you can learn about thousands of cooking ingredients and cooking terms. Also find substitutes for those ingredients you don’t have hand, nutrition information and sources for where to find those elusive ingredients.